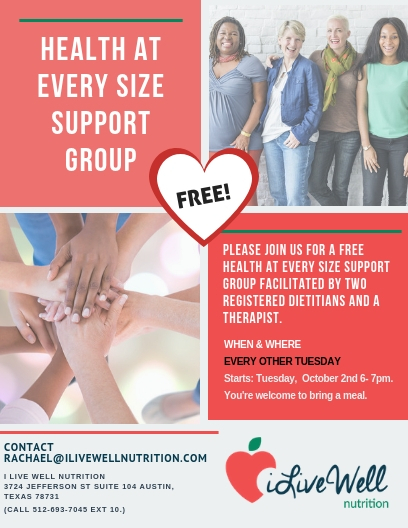 Please join us for a free Health At Every Size support group facilitated by two Registered Dietitians and a therapist. This will be a safe place to connect with others rooted in the HAES components of respect, critical awareness, and compassionate self-care. Every other Tuesday starting October 2nd from 6- 7pm. You’re welcome to bring a meal. Questions? Contact us via the form below or call 512-693-7045 ext 10. We hope to see you there! You can click here to download the flyer.